Yoga has always been considered as one of the best non-medicinal techniques to keep oneself healthy. Keeping this fact in mind, Samadhi Yoga Ashramaya has come up with some effective yoga sessions to enlighten the visitors on a healthy lifestyle with the help of Yoga. The teachers of this yoga center are experienced and are capable enough to recommend the best yoga techniques as per your physical conditions. Attend one of their sessions to learn different types of Asanas, Pranayama, Bandana and Shudhikriya. Along with the yoga sessions, the center also offers balanced vegetarian meals with Sri Lankan cuisines, herbal tea as a drink and a biking tour around the village. If you are keen in staying back, accommodations are available. Follow the rules mentioned in the yoga classes. Check the official website for the course fees. How popular is Samadhi Yoga Ashramaya? People normally club together Lunuganga and Bentota River while planning their visit to Samadhi Yoga Ashramaya. Absolutely beautiful setting for yoga and meditation on a houseboat. We had a class during sunset and it was amazing also thanks to a great teacher. Absolutely can recommend. 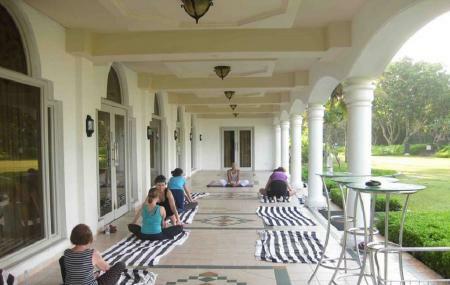 They also offer accommodation for intensive yoga retreats. Best place to chill. Meditate and do yoga. Right beside the river. If you love to learn yoga and want to stay in a very calm space where you can relax your soul, you should stay in samadhi meditation ashramaya. It is very easy to find place. Darshana is a really good yoga teacher and a kind person. You get to discover the surrounding town and environment on a bike tour. Darshana's mum prepares very authentic srilankan food. Highly recommended.